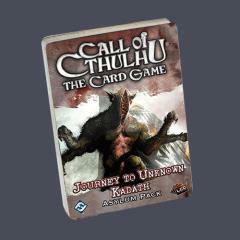 Journey to Unknown Kadath contains three copies each of twenty different cards, all based on the dark mythos of master horror writer H.P. Lovecraft. Use these cards to augment existing decks and add variety to your Call of Cthulhu metagame. Contains cards 101-120 of the Dreamlands cycle. This is not a standalone deck; you must have additional Call of Cthulhu LCG cards to play.